Heather Dessinger 273 Comments This post contains affiliate links. I Felt The Sting . . .
Every time she smiled at a stranger and they looked at me wonderingly. I wanted to explain that I wasn’t negligent . . . that my daughter had never even had a processed food, but truth is I agreed with their disapproving looks. How could I let this happen and not do anything about it? I’m talking, of course, about my daughter’s tooth decay. Though I’ve told this story in bits and pieces, somehow I’ve never put it together in a way that shares our journey from beginning to end. Today I’m going to do just that, so let’s get started! The connection between nutrient-dense diets and resistance to cavities has been well-established, which is one of the many reasons I ate a very traditional diet throughout pregnancy and breastfeeding: raw milk, lots of butter, pastured and organic meats, local eggs and organic produce. I hadn’t braved organ meats at that point, but I did take them in supplement form. 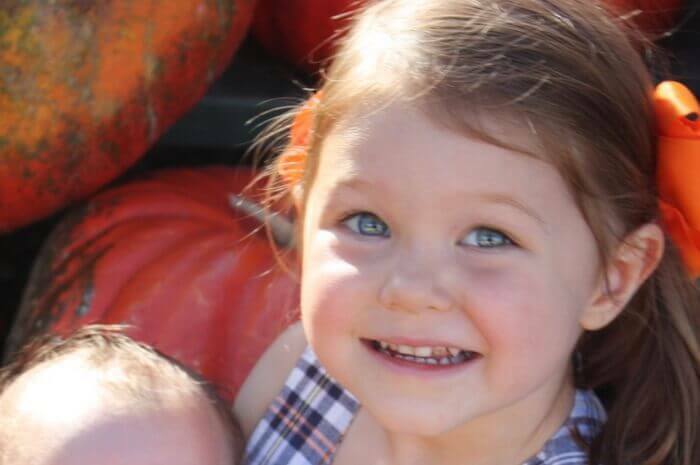 Despite all this, my daughter’s teeth started crumbling when she was 19 months old. One day I laid her down to change her diaper and realized part of her front tooth was missing. It was there when I dressed her that morning, and then it just . . . wasn’t. There was no fall, no trauma. I’d been with her the whole morning. The next day a friend who is a dentist examined her and said her front teeth were just incredibly weak. Research has shown that cocaine exposure increases the incidence of tongue ties (ankyloglossia), which is not a factor in my case. However, the fact that some chemicals have already been studied and linked to this defect makes me wonder which ones might that haven’t been studied. I’ve been making my own beauty and cleaning products for years, but before that I used a slew of toxic chemicals. I sometimes wonder if the two things might be related. For those who are wondering whether their little one might be tongue/lip tied, here’s a post on how to diagnose at home and/or get free advice from the top U.S. expert on tongue and lip ties. The second factor that I think played a role is inadequate vitamins A, D & K. Though we were eating a traditional diet, I still wasn’t fully sold on fermented cod liver oil. From what I’d heard it wasn’t an adequate source of omega-3’s. I’ve since changed my mind, but back then my fridge was stocked with several fish oils that supposedly had different benefits. Knowing what I know now I would have exclusively given her fermented cod liver oil, which I believe might have helped to slow or completely halt the decay. In addition, we were already consuming a lot of organic butter, but it wasn’t necessarily always pastured, which means it was unlikely to contain substantial amounts of Vitamin K.
The third factor that I believe played a role… One of the most difficult things I experienced during my pregnancy with Katie was that my first trimester occurred during one of the most rainy seasons on record. I deeply craved sunlight during those first few months, which I believe was related to a need for more vitamin D. It was a miserable time, and it had long lasting effects. 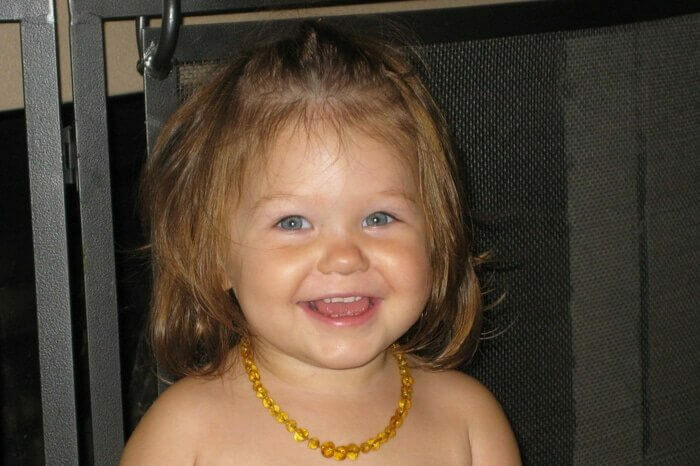 Katie’s baby teeth, which formed around the second month in utero, were very weak and porous. Fortunately, her adult teeth formed around 20 weeks after I had plenty of sunshine. Unfortunately, As You Can See . . . Her incisors became very porous and brown over time. If you’re looking closely you might also notice her front tooth appears to have partially grown back. I’ll explain that later on in the story. Exactly one year after I wrote the post about kissing toothpaste goodbye I took Katie to a holistic dentist to discuss filling options. Her teeth were so incredibly brown, and I was worried that if the decay went to the root it would harm her adult teeth. To say I was confused is a massive understatement. 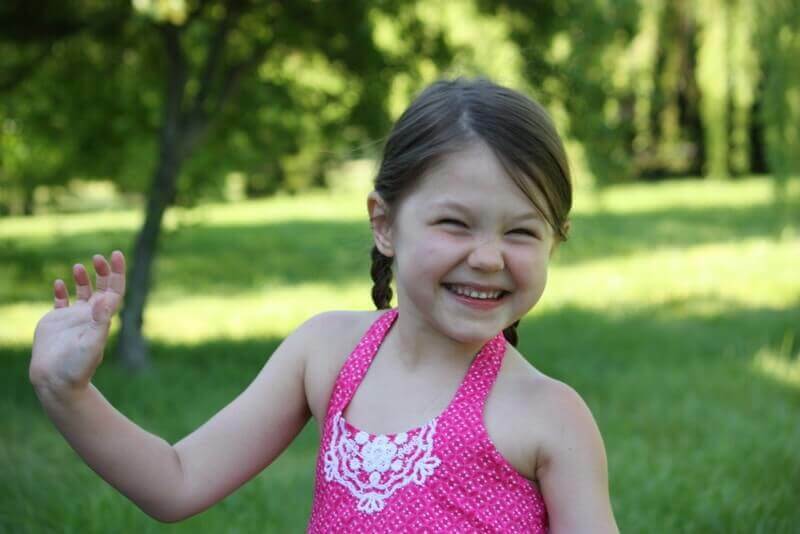 Katie had a broad, wide palate and vibrant health in every way. She’d never had an ear infection or taken medications of any kind, so why were her front teeth turning to chalk? I had no idea what I’d done wrong, but it was devastating to watch. Katie signs in her babydoll and ‘fills-out’ some insurance forms. I make a mental note that my bank deposit receipt is now doubling as a medical record for baby Alex, but just can’t stop gaping at the copy of Cure Tooth Decay front and center on the bookshelf, followed by the Cancer Is Curable Now DVD and Homeopathic Medicine at Home. Here she on Easter, just a couple months before I took her to the dentist. And here she is on the day we got home from our appointment. She’s wearing the same dress because **someone** was so excited to document her new smile that they put her in their favorite dress. 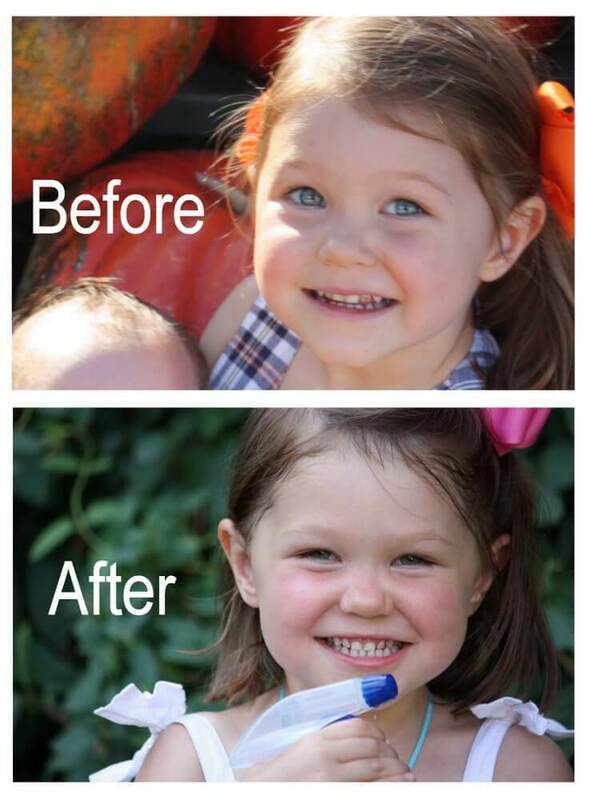 Dr. Petre wasn’t able to get the stains off completely because the vibration from the buffer made Katie nervous, but you can see that her front teeth are even, and unlike the photo taken at 19 months the right tooth extends below the tooth directly next to it. In just a couple of months it will be two years since that appointment, and I’m happy to say she’s still cavity free! Two years after writing this post, I discovered that Katie had a cavity! I beat myself up about it for awhile – after all the progress we made I felt like I missed something that would have completed her healing. I’m currently working with a Nutritional Therapy Practitioner to assess whether Katie has a certain vitamin/mineral deficiency I am not aware of. Sometimes we do the best we can and things don’t turn out the way we expect. Personally, I feel that the diet was still worth it for the healing we did see, but I wanted to share this update while we figure things out. If you’re looking for info on remineralizing teeth, Cure Tooth Decay is pretty much THE BOOK on the subject. I highly recommend it. Can a Weston A. Price Diet Reverse Tooth Decay? Hi Mommypotamus! Let me first say that I LOVE YOUR BLOG!!! Thank you for leading me to the light! My 5 yr old has 2 cavities in her molars and so I have gotten her the Green Pastures Butter Oil / Fermented Cod Liver Oil Blend. Since we don’t yet get grass fed butter/milk/meats yet (I’m working on getting those into our diet) I figured it would be best to get the blend instead of just the FCLO. I’m also giving it to my 3 yr old and 1 yr old. How long do you think it will take to see some improvement on my daughter’s cavities? I am ordering some tooth soap this week! Also, I’m giving her 1/2 tsp of the butter oil/FCLO blend daily. Do you think I should give her more since she does have cavities already? Hello! Thank you for all of your wonderful information. My son is almost 2 and we have gone through hell nursing although I know he loves it… I’ve been told by one dentist he has a tongue tie and another two dentists he doesn’t but I’m pretty positive I have MTHFR both mutations. I’ve had my son on the Weston price diet since April and I don’t see a huge difference. I’m doing everything but the skate oil. Did your daughters teeth turn dark on both sides implying she would need a root canal and then it was reversed?? I would really appreciate any info you can give me! Did she respond to this comment? 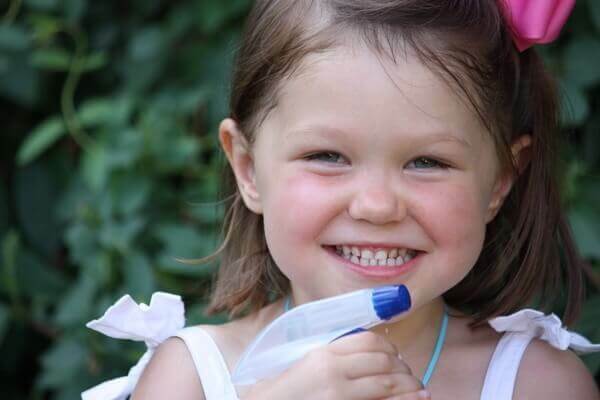 How much ionic silica did you give to your daughter.> Thanks so much for your time and response..
Hi Holly, I’m so sorry but I really don’t remember – it’s been several years! We took our son to a holistic dentist today and he told us that our son would have to have his top four teeth pulled (his enamel is completely gone) and that he has an infection in them and his gums are a bit swollen. Is it too late to save them? To reverse anything?? I feel awful that he might have to have them pulled. Hi Savannah! I’m no pro here and I’m not sure if mommypotamus will reply to you in more detail but I wanted to share my experience with you. My daughter who is 3 had terrible dental decay in her top four front teeth. I changed her diet, did fluoride varnish, brushed like a mad women, eliminated juices and sugary foods, but nothing could save these four teeth. All of her other 16 are white and beautiful. I thought she might outrun having to get them extracted until they fell out naturally around 5/6 yrs old. However, she developed an abscess in the gum line above one of her front teeth and was on antibiotics and was miserable. I cried and beat myself up sooo much about letting this happen to her but honestly it was out of my control. Some teeth just can’t be saved. My partner and I decided to go ahead and get them extracted this past January 2019 to prevent future infections and to set up a healthy environment for her adult teeth when they come in. The procedure was quick and she recovered very well and is her normal happy self again. Her dentist says her other teeth are just find. I will say it’s given me piece of mind knowing her gums and the rest of her teeth are healthier now. I know it’s totally overwhelming hearing a dentist say they have to be pulled but in the long run it might be better. Just thoughts. I’m rooting for you and your LO! I hope you find a solution that puts you at ease! Best of luck and god bless. I took FCLO throughout pregnancy and am now taking it while I’m breastfeeding. I always tried to eat lots of grass fed dairy and especially butter while I was pregnant, but I found out just a few weeks after my son was born that he can’t do dairy. I’ve thought of trying ghee but its so expensive I don’t want it to go to waste if it causes a reaction. Any other tips on getting a good balance of FCLO and the other vitamins that are in butter? You can make ghee yourself out of butter. It will be less expensive than buying the ghee. You can google it to find out how to. Making ghee is really easy. You just melt butter and continue to cook it until there is a layer of white stuff (the fats and salt) on the top and yellow oil on the bottom. Then you scrape the white off the top (it takes a little bit) and there you go! Ghee is soooo easy to make on your own. Get some grass fed butter and simmer it until the protein solids fall to the bottom and brown and any white that comes to the top skim off. Let it cool and pour through a strainer into a jar 🙂 It may sound hard but once you do it you will regret not doing it sooner!! I wish this was something my mother knew when I was little. Instead, I had over 14 fillings, one tooth removed, and now I’m in the process of REPLACING all of those fillings since they were so old. I even had one tooth break in half recently, but it doesn’t hurt so…I’m trying to heal it naturally instead of doling out insane amounts of cash to get a filling. Perhaps I should add FCLO, FINALLY, into my daily regimen and not just for my overall health. My teeth have been a weak point for me my entire life, and I’m so very sick of it! Thank you for this post, and thank you for being an awesome mom! Hello, Thank you for posting. I am currently reading that book. I have sooo many cavities (Dentist is shocked) and we eat a relatively whole food diet. I don’t think we even have access to grass fed butter but I hope to find out. 1. Is there an easy step 1-5 (for ex.) that a person can take ( I have such limited time with three kids under 4 to watch and read). 2. How do you get your kids to take cod liver oil (my husband is traumatized from having cod liver oil shoved down this throat as a child to this day he HATES sea food). 3. Also how do you introduce phosphorus foods into your diet (what food have phosphorus? Hateesha- go on realmilk.comn and search your state, if they only sell raw milk you can make your own butter from it. Hi Hateesha, I think the changes a family needs to make depends on their current eating habits. That’s why the book is so helpful – it can help to pinpoint “holes” in the diet where not enough nutrients are being obtained. I think I started out by offering Katie something she wanted in exchange for taking her fermented cod liver oil – like raisins or dried mango. I think I started out by offering Katie something she wanted in exchange for taking her fermented cod liver oil – like raisins or dried mango. We didn’t cut out fruit entirely, we just limited it. Now they take it without any rewards and say “thank you” to boot! We get chocolate flavoured fermented cod liver oil blended with high vitamin butter. The brand is Blue Ice. We called it chocolate cake to set the scene, and the kids demand it instead of the other way around. Hi there Dave. Do you give the chocolate flavored oil straight to your kids? I just got my Royal Blend from Blue Ice in the chocolate cream flavor and almost gagged when I tried it. I love sushi and sea food and it was hard for me to stomach. I know my son is going to refuse it straight so I am looking for creative ways to serve it that don’t go completely against the clean diet in Cure Tooth Decay. Please send me your suggestions!!! Thanks! Per Cure Tooth Decay, you should not use Xylitol. I, too purchased Xylitol for my little one before purchasing the book, but stopped immediately once I read that. Similar question — my daughters and I all have food allergies, most specifically to meat! We are all strict vegetarians, can we still follow the Cure Tooth Decay regimen with success? My 9 year old is doing all right, but my teeth have been rotten all my 37 years, and my 5 year old already has a cavity on her back left lower molar. Toward that end, anybody know a good holistic dentist in the Houston, TX area? Thanks! I would say it’s possible to implement some of the changes Nagel recommends, but there is a clear emphasis on animal-based foods because they are the ones that most often contain the nutrients considered vital for healing. My question to you, Mommypotamus, did you have to make eating fun for your daughter? My little one can be picky sometimes and it’s not easy to get her to eat food that she needs. Would you be able to refer me to some good recipes? Also, how did you get her to take her CLO? I put her chocolate Green Pasture’s CLO in fruit smoothies, but will need to cut the fruit out since I’ll be putting her on a strict diet. Lastly, did you use the Skate Liver Oil recommended in Ramiel’s book? Many, many thanks in advance for any input! I think I started out by offering Katie something she wanted in exchange for taking her fermented cod liver oil – like raisins or dried mango. We didn’t cut out fruit entirely, we just limited it. Now they take it without any rewards and say “thank you” to boot! Personally, I didn’t cut out smoothies altogether – I just put lots of egg yolks, butter oil and other goodies in them. I still do, and my kids love them. I didn’t use the skate liver oil, but I do think it’s a very good option. I have the first edition of his book which I think emphasizes fermented cod liver oil a bit more. Is “butter oil” a different product from pastured butter, like a supplement? I’m combing through all your replies to the comments, so I may see that you answer this below somewhere…but I’d love a source list of the specific supplements you trust, to accompany the stuff in your bullets under “The Plan” above (like the FCLO, butter oil, etc.). I’m also very interested to read a followup to the “Update” at the end of this post. Thanks for sharing all your helpful info!! Hi Mommypotamus, Our 20 months old daughter has stains on her front four teeth. Our holistic dentist removed that using pumice. She also has upper lip tie. The dentist didn’t recommend to clip it as it leaves a scar and that prevents energy flow in the body. Did you clip your daughter’s upper lip tie? If not, did she have trouble talking? I didn’t have it clipped. From what I understand it is unlikely to cause any future problems for her, but if it had been a tongue-tie I probably would have. My son was tongue and lip tied and we had them both revised with a laser to minimize scar tissue. I have a question for you. Our 20 months old daughter has stains on her front four teeth. Holistic dentist removed a lot of them through pumice. She also has upper lip tie but holistic dentist doesn’t recommend clipping it as it leaves a scar and prevents energy flow in the body. Did you clip your daughter’s? if no, did she have trouble talking? Such a heartwarming post! Thank you for sharing. Do you have any advice for brushing the teeth of little ones? I’m not terribly concerned with my daughter’s teeth because we eat a good diet and she takes FCLO (she’s 18 months). But I feel that brushing her teeth is simply ineffective at this point. I’m hoping it gets better. Thanks! Hi Karen, How did you get your 18 month old to take FCLO? Thank you for your post. So encouraging. I was wondering – do you have to continue the rigorous diet with your daughter since she is prone to tooth decay or are you able to relax a little since her teeth have improved. I am mainly interested in knowing if you are still avoiding grains and if fruit and honey are still limited. We too are eating a whole food diet but I would imagine we might be facing some of the same challenges. I have already worked hard to switch our diet and eliminate processed foods. I’m not sure how easily I could make another big change. Thanks for your help! We incorporated grains, fruit and honey back into her diet years ago and she is doing fine. At this point I don’t consider her prone to tooth decay at all – quite the opposite, actually! I recommend you read the book “wheat belly” by Dr. William Davis – he has a great youtube video Wheat the unhealthy whole grain. It will change your opinion on grains and wheat in your daughter’s and your own diet. Heather, was the occasional sourdough that you cut out, homemade sourdough? Or store bought “sourdough”? Asking because we are also doing the protocol for our 2yo and just last night made her first batch of sourdough from starter with einkorn flour. I don’t want to start her on it if we will just need to cut it out. Hi, I am concerned about my own dental hygiene as I keep getting cavities despite my best efforts! What can I do for myself? Do you recommend the same type of thing? Also I have a one year old and I’m wondering what I should do to protect him from decay? Thanks! If it were me I would definitely read Cure Tooth Decay. The protocol is designed for adults as well as children. This is amazing! I’ve heard that adults can do this with their teeth also. Definitely will have to look into this as loosing your teeth as you age runs in my family. Yikes! Thank you for writing this. Is there any resources you would recommend for healing extreme teeth sensitivity? Processed food in the past and a hygenist who scraped too hard have made it painful to eat hot or cold food. My dentist said that my nerves are exposed on several teeth and he filled them. This did not help with the pain at all. I stopped going to him. Would the book you recommended work for this? If it were me I’d read Ramiel Nagel’s book. It is my understanding that tooth sensitivity and decay are both the result of weakened enamel, which is what the book is written to help with! My husband and I both had sensitivity to fruit when we’d brush our teeth. Ouch! I don’t know what happened there. Maybe it was eating grass-fed beef, which we eat sparingly. We eat lots of eggs from chickens that follow the cows in the field. We eat local food, and not very much processed food. I still avoid grapefruit for fear of sensitive teeth. Thank you for the great information in this post (I shared it with my daughter who has an 18-month old sweetie). I’m interested in the book and such for myself. Thanks again! I have a daughter who is almost one year old and I have recently suspected a lip tie. Her top two teeth (same as Katie’s) are slightly yellow along the gum. She has a large gap in her front teeth. I will try to get a picture and send it to the doctor you recommend. To me her frenulum looks attached but it’s hard to know. I think the yellow has improved since I started fclo, more bone broth, and cleaning her teeth every night with a washcloth. It may just be my imagination though. She has always eaten according to your Nourished Baby book, so I was very scared when I noticed her teeth were yellow. I’m trying not to panic! Any thoughts or advice would be welcomed. Thank you for sharing your story. According to Dr. K if a gap is present a lip tie definitely is. I would email him! I don’t have a list of exact foods, but there are a lot of recommendations in the book. It’s pretty easy to find recipes online that incorporate them. I started out by offering Katie something she wanted in exchange for taking her fermented cod liver oil – like raisins or dried mango. We didn’t cut out fruit entirely, we just limited it. Thanks, Heather, i am definitely getting the book! Hi – I haven’t yet read all of the comments, but wanted to say that I have similar experience. My older son nursed all night long until he was 4 and he has never had a cavity – he is now 19! But my now 6 year old started getting tooth decay before he even turned 1. The dentists we went to seemed to really blame it on breastfeeding, which felt so wrong to me. After years of struggling with it, and now having a third child, I think I have figured out that the breastmilk reacts to any food left on the teeth – so it is not the breastfeeding or night feeding per se, but how it interacts with what else is in the mouth. So: always breastfeed on teeth that have been wiped clean or brushed & rinsed. Wishing u the best! Thanks for great observation n advice. I have 20 months daughter with front 4 cavities n she only can sleep while nursing. I’m being harsh to teach her to sleep wo nursing as teeth have become very bad. Does anyone have any experience with enamel hypolplasia? My 6 year old’s permament teeth are all coming in with cavities and very little enamel. Is this condition really as hopeless as the dentist makes it out to be? My children too, all have these problems in their teeth. I am soo pissed about it. Though when my oldest 2 were younger, i did not know about butter, didn’t eat a lot of meat, we have now gotten to where we eat a very traditional diet and its still bad. we FINALLY are starting the FCLO. (the kids actually LOVE the cinnamon tingle. love it so much, in fact that sometimes my 5 year old trys to sneak it). I also got the skate liver oil for good measure. We aren’t all the way grain free. we do a soaked grain usually about once a week but i am TRYING to go less and less time before using grains. sometimes its just hard. (my son, the 5 year old however always sneaks bread though its always sprouted its still annoying). my daughter (6) also has a tooth abcess. but i still feel that if we can control it by diet and at least notnn let it get bigger, there is no need to operate on it. what are your thoughts? another thing we have recently started doing is “oil pulling”. my daughter will do it but my son won’t. i have been doing it now for 3 weeks straight and i think my teeth are feeling better. so gonna keep it on the daily things to do..
My daughter is 4 1/2. We’ve been on GAPS for 11 1/2 months. Her 4 front teeth look terrible. We bought the tooth powder recommended in your post several months ago…we’ve used Earth Paste (bentonite clay) on her teeth…she has a had a good diet the past year since we’ve been on GAPS, but still has a little trouble with milk, so we don’t have her doing a lot of milk products. SOme of what’s on her teeth looks like plaque, but we can’t get it off. There are also 2 brown indentations on the other two teeth. My nutritionalist has checked them closely and says there is no infection up into the gum and isn’t real worried because they are baby teeth, but we certainly have no had the success you have had. What are we doing wrong? Should we break down and take her to the dentist? – – we don’t know if it’s the wise thing to get her started on those visits. Junita, I don’t think you are necessarily doing anything wrong. I am not an expert and am not qualified to give medical opinions, but I would guess that you’re addressing multiple issues if you’re on GAPS. If it were me I’d expect that things might be a little different under those circumstances. If you don’t have the book already, though, it might be helpful to read through and see if there is anything you haven’t implemented yet! I do have this book and have read it. The other issues my daughter has is a slight sensitivity to milk and then yeast (from me) :(. We have made huge headway on the yeast problem. We were doing GAPS just for overall health, plus for my adrenal fatigue, that’s it. We were doing a strict regimen of HVBO/FCLO until my nutritionalist discovered that it was causing more digestive upset. That’s why I feel like my hands are tied – she can’t fill up on grassfed raw milk, or take these supplements, both of which are very important for healing. That’s why I was wondering if there is something else you would suggest we try, or if it’s a matter of more time. Me again. Plus we don’t know what to do about the dentist situation. Our dentist (and all in our area) will probably want to put her on fluoride and whatever else they think will help. That’s why we haven’t taken her to have them cleaned. We don’t know if it’s wise to start dental care at this age. Take her to the dentist! If you don’t want to use fluoride look up MI-Paste. But do something! If your child loses her teeth prematurely she will probably need braces. Your adult teeth follow your baby teeth. I’m so glad you posted this. I’ve been working on applying the Cure Tooth Decay for some time but I must admit I’ve slipped a lot and not followed it strictly. I’m glad you posted about silica. I don’t remember if Ramiel had that in his book or not, but I’ve been wanting to find a good product to add bone building minerals into my diet. I saw that company you recommended also sells a bone building support, do you know anything about that or do you think silica would be enough? Thanks for your blog! 🙂 Keep up the great work! I haven’t looked into their other supplements – bone broth is my “supplement” when it comes to bone health! Thank you for sharing so completely! That feeling when you KNOW your on the right path but the results aren’t showing up yet is disconcerting. I am going to order some fermented cod liver oil from Green Pastures today, it’s been on the backburner of my brain for a year. I’ve also wanted that book for a while, maybe today is the day for that too. I am so shocked that it (not only fixed the tooth decay) but helped realign her teeth! I went to a WAPF conference and don’t remember hearing anything about it changing alignment, but I have wondered about it ever since. I have a really narrow face and mouth bridge, I wonder if it would help widen mine? 🙂 One of my daughters has a narrow bridge as well, perhaps as it develops it will widen if we get started now. As an aside, my husband read your GAPS post from 2011 today (with your husband in it) and we have decided to go ahead with GAPS. I’m 6 months pregnant and we just can’t deal with my blood sugar issues and his IBS anymore. I’ve studied it for about a year and I never thought we would fully do it but now that he is committed, we are going to start preparing. I noticed you haven’t had any recent GAPS posts– is it your opinion that it was a worthwhile experience in the end? Google orthotropics and read a bit about what they address. I think WP gets into the diet aspect of facial/jaw growth and teeth formation but healthy nasal breathing is huge in that too. Hi Marie! I wouldn’t say the protocol actually changed the alignment of her teeth. Rather, the tooth that broke actually grew back! When it first broke it was obviously shorter than the tooth next to it, but over time it actually length as well as strength. According to WAPF most of our bone structure is determined in utero, but I do believe it continues to be affected by nutrition. 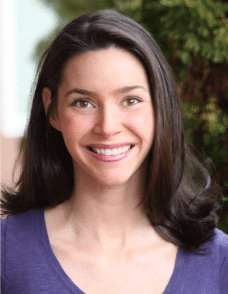 In her book, Deep Nutrition, Dr. Cate Shanahan reports growing two inches after switching to a nutrient dense diet! Regarding GAPS, yes I do think it was worthwhile. If I could do it over I would tweak my approach slightly, but I am glad we did it. I raised my son on a mostly WPish diet, with the raw milk when possible, some fermented foods, and definitely the CLO. His teeth were always fine. Recently at 10 he did begin to get cavities, which confused me but I assumed it was from the increased sweets he gets at school and friends’ houses. Anyway in the interim, we did a food sensitivity test to work on some issues and discovered he has sensitivity to dairy and eggs- so we took those out. I’m starting Curing Tooth Decay now, hoping to halt any further damage and to avoid any future fillings! Anyone else dairy free (or just plain vegan) and not know how to approach this? I just ordered more FCLO, this time with Butter Oil, hoping this and his other egg and dairy free approaches will help. Do you think butter oil have the same affects the dairy supposedly had on him? oh and as an aside his gut permeability seemed to be in good shape. The dairy seemed to make him congested, which was causing lots of breathing problems (which has been covered here too of course!) So I’m not willing to risk that again. But I feel stuck between a vegan and WP world right now. Really just want to protect his teeth though too. Heather, thanks for posting this. Natural remedies for tooth decay was something I was looking up, then saw your post in my feed! I am curious about the FCLO. My 5yo and I have problems with cavities, but I have 3 younger children also and I’d like us all to take it. Is there a more cost effective way to implement the FCLO? Ideally I’d want to get the butter oil blend, but we have to live very frugally and it’s a pretty big expense! What is the most cost-effective way to get these benefits? Great post. One question: I’ve read the Cure Tooth Decay book and I just can’t understand all the bottle rot thing, as the book, as far as I can remember, says tooth decay is caused by the internal weakness of the teeth, not by anything happening at the surface of them, like the bacterial attacks defended by mainstream. Because of her lip tie, milk pooled in the top of my daughter’s mouth and got stuck. Though most decay comes from internal weakness, it is possible to have localized decay due to external factors. You guys seriously…. Go to a dentist! I am a dental hygienist and I believe in doing things naturally if possible. Most of the people leaving comments no offense but have no dental knowledge. Brush, floss, eat a good diet, and see your dentist regularly. If you have a cavity that has not yet gone into the dentin than you can remineralize it. Otherwise you need to see a dentist or you will eventually lose the tooth. Sensitivity is most likely from a cavity or exposed root surface which is porous and transfers to you nerve easily. If you are sensitive stay away from acidic food which you should also do if you are cavity prone and use a toothpaste temporarily with potassium nitrate and fluoride. No whitening or abrasive agents. Also, brush your child’s teeth! With a toothbrush not washcloth. Don’t send them to bed with milk of any kind. Last thing before bed should be to brush. My son is 6 and has never had a cavity and my daughter is 19 months and no cavities. We use a battery powered brush and no fluoride paste for her and she loves it. This makes me so happy! Good Job Mom! I’m not sure why my brush, floss, eat healthy, and GO TO THE DENTIST post was deleted? I have a 15mth old,5 and 6 yr old. The 2 youngest will take the cinnamon fclo/butter blend. It is too spicy for my 6 yr. old. Have you tried the chocolate? I read someone used an orange flavor? Also what the heck do you feed your kids for breakfast? Especially if you are trying to stay away from grains and fruit???? We do a lot of eggs but we get tired of that. Help! Hi Annette, I’m sure that Heather will have great ideas for you about breakfast menus. I just follow the meal ideas on pages 108-111 in Nagel’s book. We’ve had sushi rolls for breakfast, potato pancakes, fish cakes, raw cheese custard with a few fruits, etc… Hope this helps! Thanks for this post! When I took my son into the pediatric dentist for his check-up and asked if they were familiar with Nagel’s book, they looked at me as if I had two heads. I was pretty bummed. Rumor has it there is a holistic dentist four hours from me, but I’m still trying to find one here in BC. There is a fabulous tongue & lip tie support group on Facebook. I joined it after making the connection between my son’s digestive issues and his unrevised posterior tongue tie. Dr. Kotlow and several other experts in the field will occasionally chime in. It’s a great place to discuss handling revisions and the protocol afterwards. For whatever reason, I cannot link to it, but anyone can find it by putting Tongue Tie Babies Support Group in the search bar. Where in BC do you live? I live in Enderby, and I’ve heard that there is a really good dentist in Kelowna. I don’t know what he is like (after all, I haven’t visited a dentist since I was six), but my neighbour highly recommends him. Thank you, Thank you! I could write the same background story for my 2.5 year old. Word for word, it is EXACTLY the same as my sons from the beginning diet, to the dates he got the decay, to the lip tie, AND the time period that he first developed it. I’ve been putting off buying the blue ice fermented cod liver oil/butter oil because of the cost but now I’m motivated than ever to do it. Hopefully we will have the same results. I get the same feeling as you did when people look at his teeth and automatically assume i’m lazy or let him drink soda. We want to implement the same strategies & have started using toothpaste with no fluoride. However, we have fluoride in our water. How much, do you think, will this negate our efforts? Futile? Does your family use some sort of water filtration system that you could recommend? When I search for products such as these, I find them all to be outside our budget. We try to use bottled water but the fluoride is in our ice and we cook with it, etc. Thanks so much to all with suggestions! I just want to say THANK YOU for posting about this (I don’t remember, I think I may have commented before)! I’ve been following the same protocol with my daughter (though I admit we haven’t adhered to it as stringently) who’s teeth look JUST LIKE THAT, it might as well have been her mouth 🙂 I’ve been really discouraged. By strangers, by grandparents who keep feeding my kids sweets/grains, and by my Self actually too. It’s refreshing to see it can be done, it’s so hard to keep at it. Thank you for the encouragement not to give up! 🙂 I’m hoping at least her new teeth will come in stronger as we continue with FCLO every day. I love your blog! I am wondering if you have any recommendations for my 3 year old. 6 months ago he had his first dentist appt and he had a whopping 8 cavities! We were eating pretty well, but now we have incorporated raw milk, FCLO, and butter oil in to all of our diets, but I just had another dentist appt and he still has all the cavities PLUS another one! I was really hoping for none at all. It is a biological dentist and he said my son has 5 that are beyond trying to remineralize and they will need to fill them. BLAH! Any help? I do have to say that I don’t do all the things in the heal your cavities book. Mostly just adding the milk and oils. He does eat sugar often b/c people are constantly throwing it at him which I hate. I was wondering if you have any resources for information on how to help with gum decay/disease/ receding gums or if this is also covered in the Cure Tooth Decay book. I am fortunate that my teeth themselves are in good shape, but I’m having trouble with my gums. Any advice for resources would be so greatly appreciated! In the “Cure Tooth Decay” book does he talk about healing a chipped tooth at all? My husband was boxing with a friend a few years ago and chipped one of his front teeth. He never saw a dentist about it, but is considering seeing one because it is really sensitive when he eats cold things. I was wondering if reading that book would give me any info on the subject or if you had heard anything helpful on naturally healing a chipped tooth? When you mention making chicken bone soup, it doesn’t sound like you use the whole chicken. Do you just use the bones after you have made roast chicken, for example? I know that my French grandmother used to do that but wonder how much nutrition is left in the bones after it’s been cooked. It’s amazing to me that we can heal our bodies in such a way. Fascinating. Thank you so much for this post! I referred to the previous post you mentioned also which helped me a ton! 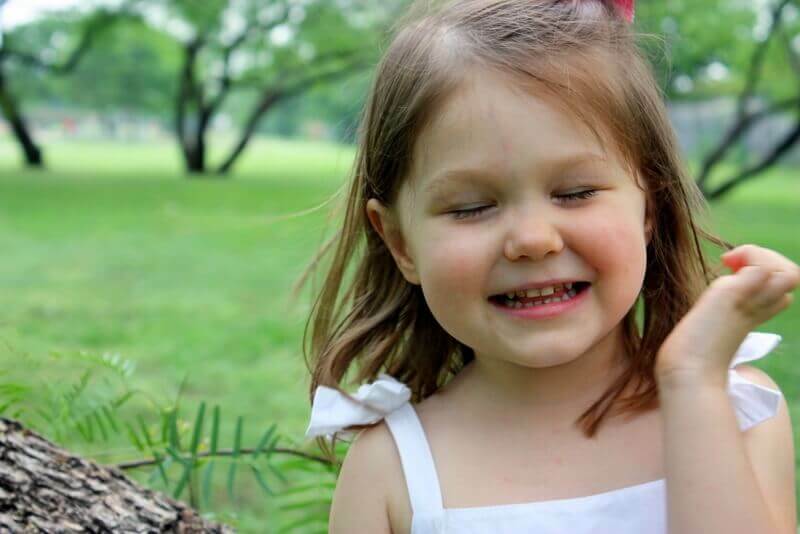 My daughter is almost seven, but when she was three she had fallen and caught her lip on a counter and ripped that piece of skin almost completely. I then realized (since we were still nursing) that that is why we had struggled nursing all this time. Little milk supply, colic….ect… She healed well and even her smile was bigger. (We have been to a dentist a few times since, but nothing was ever said about it). Today, my daughter took a fall in the car and you can guess that she ripped the skin the rest of the way. I think I will still have her looked at, but am confident it was a blessing in disguise. Thanks for sharing you’re experiences with us! For those asking about curing tooth decay while dealing with food allergies/sensitivities . . . Our family has number of food sensitities. We have issues with gluten, grains, dairy, nightshades and citrus. We try to eat full GAPS, at thos point. Before we discovered GAPS I read the Cure Tooth Decay book. A couple years ago, my daughter started showing signs of cavities. Our dentist uses a device called a diagnodent (sp?.) It’s a laser device that seems to measure tooth density. The dentist wanted to drill and fill several places. I put him off saying I wanted to research it more. That’s when I bought the Cure Tooth Decay book. Because of our food issues, FCLO/BO didn’t work for us. I never had the money to try the FCLO seperately. After a lot of research, I ran across a study where they used vitamin k-mk4 in a study to improve bone density in osteoporosis patients. I don’t remember the exact figures but it increased bone density by like 60% in like 6 weeks. Before we started our regimen, my dd’s diagnodent numbers were all in the high 30’s to early 40’s indicating that she had cavities begining. 6 months later, all the numbers were single digits! We took Solgar Cod Liver Oil, Carlson vitamin K-MK4, Country Cal-Mag w/phosphorous, vitamin D. We also eliminated sugar and substituted stevia w/ a little honey. We added grassfed beef -mostly hamburger and liver. We got rid of our conventional toothpaste and replaced it with IPSAB Tooth Powder or Ecodent. We also took 3 bottles of Dr Ron’s grassfed beef liver split between my ds, dd and I. You mean density improved in 6 months when you took lot of supplements n diet but then decreased to 89! Can u explain pls? I’m thinking to start such supplements to my daughter so appreciate your reply. We also used the sevices of an ND with a biomeridian machine to determine proper doses of each supplement and which supplements would be most effective. Hello. 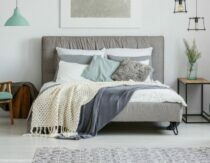 Is there a way to get a promo code for those of us who are on a serious budget? Also, is this 100% guaranteed? If I don’t like it – can I return it for a full refund? I viewed your “how to make chocolate body butter” on your website but found that I couldn’t make out a lot of what you were saying due to poor audio (your kitchen echoed) and wasn’t sure where to get those ingredients. And I couldn’t here what you said about the chocolate. Was that actual chocolate? I’m not sure I’d want chocolate on my skin. Sounds a little icky. I’d like a clean scented smell instead of smelling like food. Please advise. Hi Marilyn, you can email me at [email protected] and I’ll let you know when the next sale is coming up. The book does have a money-back guarantee and the recipe does use cocoa powder, but not actual chocolate. I am curious if the fluoride in your water was every checked. Tea contains very high amounts of fluoride and it is known to make teeth turn brown and fall out. I also wonder if you practiced sun avoidance and sunscreen. These block vitamin D from the sun which is an extremely potent source. THANK YOU!!! We had a dentist appointment last month and found out that my daughter has cavities, one in each back molar and then a cavity between her front teeth. I’ve been trying to figure out how because she doesn’t eat a lot of sugar, we a whole foods diet, and she still nurses, but lately I’ve added FCLO to our diet (I sneak it into her water) and upped our tooth brushing regiment which has been h*** but we’re trying. I hadn’t heard of the upper lip tie, but my God that explains a lot. The colic, the low milk supply, the speech delay, the front teeth cavities. I’m going to check her tonight for this. And thank you for making me feel like I wasn’t a bad mom. I’ve been beating myself up since April thinking there was something I was doing wrong. I feel like maybe I’m not so bad after all. Thank you so much for the info. I had never heard of lip tie and thought that that was how it was suppose to look because well, that is what mine looks like. I have a 4 1/2 year old and a 13 month old and I wish I had learned of this earlier. My younger lip is tighter and I he has a very clampy latch. Both have the gap in their teeth. I was wondering if it would cause issues down the road with jaw/ facial bone and muscle development? Bfing it difficult but at this point I don’t know if that is enough of a reason to clip it. I just don’t want long term problems. I read some of your other posts a lip tie as well as some other stories and I was wondering about some of the difference between the laser vs cutting. It sounds like cutting would still leave the extra tissue between the teeth and not fix tooth alignment, is that true? Also I saw where I could email the doctor but not how to attach the picture, so I emailed them but have not got a response. Thank you, any advice you might have would be great. Hello! Great post. We are going through this with our 19 month old right now. Did you night nurse? If so did you wean her once you discovered the tooth decay? Thank! Hi Heather! I love your blog. And this story is so inspirational for me. I am considering buying Heal Thy Mouth presentation. I already have Nagel’s book. 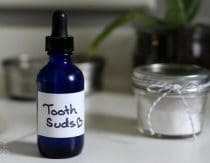 What caught my attention is one of your notes in regards to the summit: What to put on a child’s teeth if they have baby tooth decay to slow it down (or even stop it) while you work on diet. My son has some decay on his baby teeth and one of his molars has chipped a few days ago. So I was wondering if that comments refers to some safe dental treatment or something we can do at home? I’m still debating if the presentations are worth the cost and go a lot beyond Nagel’s book. Thank you! Hi Tatyana! The “what to put on your child’s teeth” reference comes from a talk given by Dr. Julian Holmes on the use of ozone during dentistry. I found it very interesting and encouraging! Thank you so much for this post. I bought the Heal tooth decay book about 6 months ago to heal my sons tooth decay. We use to eat a standard western diet with store bought bread and crackers etc, I thought I was making healthy choices for my family by choosing wholemeal. My world has been rocked since reading the book and from there I now have nourishing traditions. So we have cut out grains and now for a treat I will soak spelt flour and bake something nice once every 2 weeks. I’m finding it hard coming up with foods that my son will eat while trying to limit the fruit intake. He gladly takes fclo/hvbo blend thank goodness. Did you include rice while healing Katie’s teeth? And did you soak the rice before eating? I meant thanks. This saved me from crying my eyes out after noticing two tiny brown specks on my daughter’s front teeth today. She is 3 and her teeth grew in with tiny white spots. A wonderful woman from a FB group that I belong to provided your link for me to read. I was feeling like a horrible mom. I’m going out to get fermented cod liver oil and making my own toothpaste tomorrow. Thank you so much. I am so glad you found this post comforting, Toya. Hugs to you! Thank you for sharing your experience! I had a similar experience with my older son. I was vegetarian (mostly vegan) during my pregnancy with him. His teeth pretty much came in with brown spots and his jaw was pretty narrow making his lateral incisors point nearly straight back. We drastically changed our diet when he was just over two years old (when my second son was born with craniosynostosis… that’s a whole other story) to include pastured eggs, homemade butter, raw milk, broth, and meats including organ meats. Over time, probably a couple years, his teeth (all our teeth) became visibly stronger and whiter. He is now 7 and no longer has brown stains on his teeth. Oh, and his palate has widened drastically as well. Although his adult bottom teeth are coming in a bit crooked, I am sure it would have been much different if we would have continued on a nutrient deficient diet. I will be interested to see what his top teeth do, as they have not started to fall out yet. We plan to treat his crowded jaw with a Biobloc. Thankfully with my younger son he has beautiful cavity free, properly-spaced white teeth. He’s lucky that we changed our diet while I was still nursing him and his first foods included egg yolk and marrow! I don’t think he’ll need orthotropics. Has anyone heard of http://www.thedentalessentials.com/? It is a supplement that supplies the same nutrients that are in the cod liver oil, etc. but seems to be cheaper. I’m not finding a lot of testimonials online, but the research that has gone into the product is very impressive. Thank you for this encouraging post! Seems like such a miracle, but I know it was hard work too! I only spent 10 seconds on the website because I need to get the kids ready for the day. My first thought is that the supplement doesn’t contain true Vitamin A (pre-formed, not betacarotene), which works synergistically with D. For that reason and because fermented cod liver oil contains micronutrients and co-factors, I personally do not consider them to be equivalent. 1) Am I reading this right– you did the “diet” (plus supplements, etc.) for about a year to have those amazing results? So after the good results, and “all clear” dentist appointment, you slowly added back the fruit, grains and honey? 2) Has anyone out there had luck reversing a cavity with less stringent diet modifications? (Thus my earlier post asking about Dental Essentials supplement?) Seems like Healthy Home Economist’s son still was eating his toast and butter and experienced healing. Would love other stories! THANKS!!! This is all so exciting! Thanks! So did I read it right that you were on the restricted diet for about a year? Just wondering how long we might have to restrict our diets. We have a lot of situations where I don’t have control over what my kids eat, so I’m trying to figure out a plan. I am loving perusing your website as I get time! THANKS! Toya, the only truly fermented cod liver oil is made by Green Pastures. Most people find that the cinnamon tingle is easiest to get down, thought it’s a bit strong for some. We buy the unflavored. Hi, I have been trying to save my kids teeth but they HATE any kind of the FCLO. I also was wondering how you found your dentist. Mine is making me feel guilty since I don’t brush and floss both my kids teeth after every drink or food. Just FYI…we are trying our first bottle of FCLO, and upon many recommendations we are trying the cinnamon. The kids think that the cinnamon taste is a little weird, but since it’s our first try they don’t realize that maybe it’s way better than it could be! But Heather’s recommendation of the unflavored may be best for us too. We’ve tried taking it, quickly following with bite of applesauce, and holding breath until done. I think a quick OJ chaser would be good too. I tried to read the post, but I couldn’t get past the part about you drinking raw milk when you were pregnant. My daughter is almost 4 and she has a real problem. She has seen a dental surgeons and he said that she has “major tooth decay” from, apparently, being breastfed during the night. He wants to put metal caps on all her molars and completely remove her two front teeth! All this makes me so frightful. I believe in the body’s ability to heal itself, but I just don’t know what to do at this point. The surgeon said that if I let these teeth go without surgery, it will affect how her adult teeth come in. He said that something needs to be done asap! Truth be told, I haven’t been the most vigilant about her diet. She basically lives off grains and cereals. I want to start her on a program to reverse her tooth decay (well, the whole family would adopt the program! ), but the dentist has made me so fearful that it’s just too late for that. I don’t know what to do! I cannot say what is right for any family, but I do believe that in some cases intervention is necessary. Personally, I would contact a holistic expert such as Dr. Felix Liao for a second opinion, then follow his recommendations. I have a 22 month boy with big dental problems:big tooth decay ( the process started around his 10 months), half of his 4 superior incisives are gone ( broke), the rest are yellow. We been to doctor, even try to put fillings which was very traumatic and we decide to stop this intrusive solution. All the doctors (4 of them) sad that is because of the night brestfeeding :-(. I’ve started to give him silica, that you recommended but I’m not sure about the quantities or if I should worry about side effects. Can you help me with this info? I’m feeling so powerless and desperate. Thanks, can you tell me how much silica should I give him? Thank you again. Thank you so much for this post! I read it a while back and really appreciated it, but was so thankful that my daughter had healthy, white teeth. NOW at age 2 she has the start of some grey discoloration on the gum line of her two front teeth. All of her teeth look grayish instead of whitish…this seems like it’s happened pretty suddenly. She’s been eating more grains and raw honey than I intended, but still she loves fermented veggies and has them daily along with organic meats and wonderful pastured raw milk. Yet, still nighttime nursing has been a struggle and I really resonated with the terminology of “breast fed version of bottle rot.” She has been nursing to sleep since birth (so definitely AFTER her teeth get brushed for the night they are bathed in lactose). AND brushing her teeth is a major struggle so it has not been done properly ever really. So, I immediately got more diligent with the fermented cod liver oil and added in the high vitamin butter oil (plus we eat natto for the K2 and nattokinase among other things). Our toothpaste is homemade with clay, coconut oil, a pinch of stevia powder, salt, and peppermint eo. I came back to your post and so much appreciated the hope that it provided that we can stop and possibly reverse what’s going on. Like you, I didn’t think this could happen to me with her having a nutrient dense diet and healthy pregnancy. I ordered the book your recommended as well. This is such a stressful thing. Thanks so much for the inspiration and ray of hope. hi! i was wondering how you got your kids to take the cod liver oil and the butter oil..?? mine just spit it out or puke before it even goes down 🙁 any tips??? I never had any problems nursing my daughter (now 3.5 years old). Her teeth are happy although she has a gap which runs in my husband’s family. Just today my friend told me that she noticed a lip tie in her son who is a year old. She has had trouble nursing, etc. Out of curiosity, I looked it up and found that my daughter has what appears to be a stage 4 lip tie! Is it possible/common to have a lip tie but have no other issues. Her teeth are very healthy now – it is possible to be diligent in cleaning and diet to prevent tooth decay? I have been doing SOOO much research on this since we started battling my son’s tooth decay. I’m no pro, either, but it seems like genetics also plays a huge role. As well as – as some have said – mom’s nutrition during pregnancy. Honestly it seems like there are so many factors, it’s kind of like the perfect storm. I bet the LT is one of those factors and some kids do fine even with the tie. I have just noticed some discoloration on my sons front teeth, and I remembered this post. We also eat mostly WAP but he was conceived accidentally, while heavily nursing his sister, so I always worried about his teeth. He also had a TT and LT that was lasered 6 months ago. Were you still nursing katie when you saw the decay? If so, did you night wean? I’m thinking that maybe I should. Fortunately his teeth are not too bad yet. He has fallen on his face several times and only chipped one small part so far. I can see brown but only on the back of his teeth. Hi Heather! Thank you so much for this info. My son is almost 18 months and his teeth look to be pretty weak, stained, and one of his front teeth is chipped. I have been trying to brush his teeth since he was little, but he really does not like it (throws fits, closes mouth, cries, screams…) We only eat organic and while I was pregnant I drank raw milk & was really getting into the Weston Price diet/suggestions. However, after he was born we discovered that he has multiple food allergies/intolerances: dairy, soy, gluten, corn, eggs, beef… and is sensitive to some other things. That makes following the Weston Price diet pretty difficult, actually feeding him in general can be pretty challenging. Luckily, he is still breastfeeding, but he is so sensitive that even I cannot eat dairy, soy, etc. I just made your recipe for tooth soap and tooth brightening scrub and am determined to brush his teeth with these, despite his tantrums. I am also going to start doing cod liver oil, was deterred in the past because some have soy in them and another was encapsulated in bovine, so I need to do a bit more research to make sure that I get the right one. I’m also going to order Ramiel Nagel’s book, and do the silica too. I feel like his teeth are so week due to lack of calcium, though we eat lots of leafy greens and try to get it from as much non-dairy sources as we can. I’m wondering if you have any other advice for me? I appreciate anything you have to offer. I am trying to be the best mom that I can be, by accommodating his unique diet, and now his teeth? Ahhh. Please help. Thanks and awesome job with your daughter! There is hope! Hi, Heather. I have a question about the lip tie revision. In Katie’s pictures (so adorable! ), I notice her upper lip seems to partially cover her top teeth in all except her final “after picture.” I assume this is post-revision. Did you notice that her upper lip starting coming up a bit when smiling as a result of the revision? I have a 3.5 year old with two brown spots on her top two front teeth. Her lip does cover the top portion of her teeth even with smiling, and I believe it is also due to an upper lip tie. I was curious if a revision actually helped to change that. Forgive me if this is in here somewhere and I missed it but how long did you follow the program before you saw/noticed a difference? I was just informed my son will need 5 caps and a filling. While his teeth aren’t *visually* as bad off as your daughter’s were initially he has severe decay on the backs of his 4 upper front teeth and is losing material on one tooth. We’re getting started on some weston price methods but I’m wondering if it’s too late? We have a lot of bad eating habits I’ll have to reverse while introducing the new program so I’m not sure I’ll really be making progress. I’m wondering how long I should give myself before I just fold and have the dental work done. I don’t want him losing any teeth. Thanks! Hi, Dawn. I think you’re looking at at least 6 weeks. The study on Vitamin K2-MK4 that they did in Japan to show the effects of MK4 on Osteoporosis showed results in 6 weeks. I can’t find the link right now. These articles reference that study but don’t quote the length of time. I have found your blog about tooth decay so very helpful. There really isn’t that much info out there on the subject. I realised my son had tooth decay when he was about 18 months old. I have Ramiel Nagal’s book. I was wondering if you have had a vegetarian’s contact you as we have cut out sugar and fruit in his diet and put him on vitamins and minerals but I am finding it hard to cut out grains. Any help? I was on the Weston Price Foundation’s website recently and I believe they have a section for vegetarians. Warning: It does start with a series of articles on how the foundation believes vegetarianism is not the healthiest lifestyle. But there is some valuable information if you read through it. Hello Heather! I have a nearly 2 year old with decay on 3 of her top front teeth. I know a lot of the decay has to do with her diet and upper lip tie. I am trying to access raw milk, butter, and meat from grass fed cows. My question is how or what shellfish do you have your daughter eat? I am not a fish person, but I want to do whatever I can to help my daughters teeth. Any special recipes? Also where did you get the liver oil from? Thanks! I’m so thrilled to find your website Heather! Both my children (3&4) are experiencing this same thing. I felt so discouraged as well when strangers would say hello and my children would have big smiles saying hello as well feeling as if I do not properly take care of their teeth. They’ve always been on a based whole food diet. They have a Natural Pediatrician, but I never thought about a holistic dentist. I have found one that is 3 hours away which I’ll take! I will be purchasing the book as well. Thank you so much again for making me feel hopeful on this journey! I’m dealing with this exact situation with my 19 month old son. He has a severe lip tie that went undiagnosed until i found it two months ago and i worked nights during my first trimester, so not a lot of sunlight. His 4 top incisors are pitted and rough and they aren’t even in all the way yet! We went to a conventional dentist yesterday who made a very bad impression on me. First, he blamed breastfeeding for the decay, which any well-informed breastfeeding mama knows is not the case, second, he completely blew off the lip tie, and third he recommend daily ingested fluoride and monthly fluoride treatments at his office. Three strikes! I came away very, very displeased, and am determined to redouble my efforts to correct this problem without subjecting my kiddo to toxic fluoride. I started taking cod liver oil and vitamin d supplements myself a month ago, in hopes of bolstering my breastmilk, i ordered Dr. Christopher’s tooth powder, I’m reading Cure Tooth Decay, and I’m looking in to xyliyol. I’m not sure what else to do, but I feel very close to panicking! I’m sorry to blast you with questions like this! I’m in freakout mode! Thank you in advance! Thank you so much for this post! I read this a while back, just in case… and now my nearly 3 year old shows signs off tooth decay 🙁 We have struggled with eating healthy as she is EXTREMELY picky… I noticed the white marks along the gum line first, but in trying to research what it was, all I could find is a possible loss or change in minerals/nutrients in her diet that caused it or an injury. I just read the Cure Tooth Decay book yesterday and see that it’s actually the first sign of tooth decay… if ONLY I had read this sooner 🙁 We already eat grass-fed meat, but I have to turn it into jerky for my daughter to eat it. She is a twin, and I just checked both girls for a lip-tie – both have them, but my daughter with tooth decay has more of a lip tie. I honestly didn’t notice the actual decay until the last week (I check regularly) and I took away milk (processed – still look for raw milk) a week ago… I just couldn’t deal with giving her processed milk (she LOVES milk) anymore, so I took it away. So maybe the lack of calcium in her diet made the tooth decay progress further? Not sure… I did just start giving her FCLO a few weeks ago, but not every day – since I noticed the tooth decay, it’s now EVERY DAY! I ordered the butter oil and skate liver oil for her – waiting for it to arrive. Also ordered bone broth from US Wellness Meats in a 2.5 pail – it’s made from the Nourishing Traditions recipe, so I am trusting it until I can make my own (I have 2 jobs and twins – busy, busy). My girls LOVE crackers, donuts (special occasions), and some cookies. Family members love giving them candy because it’s a special treat since I rarely give it to them. I’m getting rid of all of it! Though I worry about what she will get at daycare (I will be discussing this with them). My daughter is so picky, but loves fruit and bacon. Moms, do you think high quality grass-fed bacon is okay? How about grass-fed beef jerky? The book mentions delicately cooked meats… so I’m not sure. We eat a LOT of it as that’s the only meat she will eat besides jerky. I just started making my own jerky – it’s Elk; wild game meat. I plan to make more with grass-fed/finished meats for her. And our bacon is highest quality from US Wellness Meats – sugar free/uncured. I plain to make my own as well, but having trouble finding high quality pork belly and it’s such a process.. it’s easier to buy. I honestly don’t know what to feed her… she now says she is constantly hungry since I took milk away. I wonder if I can find a Raw Milk source (I’ve looked, and asked – we have one an hour away, which is really far for someone in my situation), if Raw Milk is okay for her with a lip-tie? Moms with children with a lip-tie, do you still give milk? I’m worried about it, because she loves it so much and I’m assuming that’s part of the issue, since I rarely gave her juice (when I do it’s often homemade/fresh squeezed). I’d love some thoughts from anyone on meal suggestions!!! And if you are going to tell me to take her to a dentist, I’m already looking for a holistic one… 😉 Thanks! I found bacon! Yay! My search function wasn’t working in my Kindle book; my apologies! I still couldn’t find jerky, and I’m not sure if I should do milk with a lip-tie issue… ?? I had to give up… my daughter’s teeth only got worse, as I could not get her to eat the 95% of the suggested foods. She started refusing FCLO after a few months of taking it. I feel that the decay at least slowed down when we were doing FCLO, and Dr. Christopher’s Tooth Powder, plus following as much of the Cure Tooth Decay diet as possible. We couldn’t find a good raw milk source, so I was using Dr. Christopher’s calcium supplement for kids. It seemed to make a difference at first, but slowly got worse. My daughter ended up with a bad ear infection and after getting no help from a naturopathic doctor (she was terrible), we went to a pediatrician who put her on antibiotics (I greatly struggled with that decision). I didn’t realize the impact of antibiotics on teeth… my daughter’s teeth were 50% worse within 24 hours of starting the antibiotics… yikes. We went to the pediatric dentist right down the street, and he was wonderful! I was so worried about going to a mainstream dentist. My daughter is a twin and her sister has excellent oral health. The dentist had no explanation, but he does want to clean the cavities and cap her teeth. At this point, I’m afraid I have no other choice. I tried to find a holistic dentist for my daughter, tried to work with what I thought was an excellent naturopathic doctor, did my best to follow the CTD diet for several months, etc. Nothing worked for us, BUT I feel that part of that is due to her age and pickiness. If she was younger, I could have easily got her to drink bone broth, take FCLO, etc. without any issue. As she is 3 years old, she would rather starve then eat/drink some of the healthier things I’ve tried to give her. While I feel I lost the battle with this one, I am thankful to have found a nice pediatric dentist to help us. I believe in doing things the ‘natural’ way first, but it doesn’t always work for every person. I have done so much research on this topic and honestly was very scared to take my daughter to a dentist, because of the horror stories from other parents. I hope other parents out there will have more luck with this method, but just know that if it doesn’t work, you aren’t the only one. Keep in mind that tooth dacay could also mean more than poor nutrition. I have been following a Weston Price diet for my 2 year old for almost a year and his teeth got worse and worse and then other things starting developing… Excema, constipation etc… We finally took him to a hollistic doctor who discovered he had a blockage in his lower intestine. He now takes a myriad of supplements in addition to the diet. His teeth are ready bad but I still have some hopes of healing them now that we are discovering the root cause. Great blog! I nearly cried the first time I read this because my daughter who is now 2.5, has been going through this since she first sprouted her first teeth. I had no clue, before reading this, that she is lip tied! Her little top teeth have been decaying and I couldn’t figure out why if I am not giving her juices or candy or sweets! You have brought me to the light and for that I thank you! I am reading Nagiel’s book on decay and have started the FCLO and removed almost all grain. I sank in my chair when I read that oatmeal causes tooth decay in small children. I use to feed her that 3-4 times a week thinking it was so healthy for her. Lesson learned! My question to you is this, I can’t cut out bread completely out of her diet, sometimes we will take a half sandwich on the go for her, what bread do you think would be less damaging? Sprouted wheat, whole wheat, sourdough, etc? Second question. I dont know what to feed for breakfast anymore. Right now, she’s eating egg (from pasture hens) almost every day. What would you give Katie for breakfast? Third question: I read you gave Katie the unflavored one. Did you give her a teaspoon or 1/2 tsp a day? I give Sierra 1/2tsp of the chocolate FCLO but will be switching to the unflavored. Thank you so much for sharing your story with us, it is greatly appreciated!! First of all, wow! What a great blog, and thank you for all your work. A. Do you believe it possible to heal her teeth (especially the middle two that are broken into the pulp) to the point where she is pain-free and has re-grown some dentin and enamel? B. Do you know if, and to what extent, cow and other products such as: bone marrow, organs, dried meat etc. can be replaced by wild meat? It is difficult where we are in Canada to find proper, grass-fed cow products, but we do have access to an abundant supply of venison and elk. I have located a grass-fed goat milk supplier, whom I will be calling ASAP in the morning, assuming that goat milk would be comparable to cow. C. Our daughter is currently still breastfeeding, is this the right way to go in this regard? We believe, after reading your article that she may have a lip-tie, and will assess that as well as take her to a pediatrician tomorrow. Once again, thank you for providing this resource, and for your insight. Heather, forgive me if you already answered this in the comments and I overlooked it. My daughter recently went to the dentist and was told that she has several cavities. I read your article a long time ago and so asked the dentist if the enamel would “grow back”. She said dentin will grow back but not enamel; once it’s gone, it’s gone. What’s your take on this? A dentist has confirmed that my daughter, 18 months, has tooth decay on her four front teeth in addition to 2 cavities. He is suggesting surgery and crowns for all 4 teeth along with general anesthesia. I am terrified. I know she has a lip tie, my 6 year old has one as well. But we never had any problems nursing or latching on that didn’t initially last a few days when they were born. They were both thriving as infants. We are a whole food eating family. As much grass fed beef as possible. I’ve started making bone broth and we were already talking fclo. But I have my toddler on the fclo butter blend. We eat pasture raised butter, organic eggs and organic fruits and vegetables. I am terrified mommypotamus. I don’t know what else to do. I do not want to put her through surgery. The dentist suggested I stop nursing as well but I am not ready to wean and neither is she. I’m a stay at home mom and pretty much nurse when ever she wants including night time, we also co-sleep. Is there any advice you can offer? Is there anything else I can add to help the reversing process? How long did it take for you to see results with Katie? I know this is going to be a long rode but I don’t want to see it getting any worse. A bonehead dentist suggested the same thing for my 2yo – general anesthesia surgery and crowns. I decided that level of intervention was unacceptable for baby teeth. I found a holistic dentist who manually scrapped off and gently filled the cavity with no anesthesia (just a nemo dvd) for 1/10th of the price. We followed the diet in cure tooth decay for about 2 years and the dentist agreed that the cavities had healed. zthe teeth are discolored, but the surface is strong not crumbly like in the past. Hi , I’m not sure if you can help but I’m hoping you might be able to give me some advice. My adult teeth were so weak that I now have to wear a Partial Upper denture. However my dentist left 3 of my teeth in including one of my front teeth as he felt they could be saved and needed a good clean to get rid of the decay. I was given some white fillings too but since my temporary denture has been fitted I’ve noticed my natural teeth he left in at the front seem to be getting yellow and its making me so unhappy because the denture doesn’t match my natural teeth color at all. Do you think that when he scraped the decay from my teeth he took away the Enamel so every stain is clinging to my teeth as they don’t feel smooth when I run my tongue over them they seem a little poreus. I have a 13 month old with a similar issue, only the top two front teeth are about half dissolved. The dentist believes that my daughter somehow traumatized her gum area in the womb or during delivery and thus damaged the enamel on those two teeth as the other teeth are all healthy and strong. Even if there is no way her teeth can grow back, I still believe I will implement this to hopefully strengthen what tooth she has left. (the dentist does not yet have a plan as he wants to see how the teeth look in 3 months) I just want to clarify…. Are you saying you were able to restore the tooth and that the chipped off portion grew back? Thank you for posting thia. My 19 months old daughter has really bad cavities on her left upper lateral incisor, and the two top front teeth and right upper lateral incisor have early cavities too. The pediatric dentist recommend extractions or putting the crowns on four of those teeth under general anesthesia. I’m not refusing crowns but she’s definitely too young for general anesthesia. I switched to another pediatric dentist who listens to me and willing to try to fill her cavities. After 1 week of trying, I’ve successfully night weaned my daughter from night time breastfeeding. She still wakes up in the middle of the night and wants to sleep with me but won’t ask for breastmilk any more. I keep brushing her teeth and using the spiffies wipes during the day, but her left upper lateral keeps chipping off. I would love to hear some experience shared from you. Saw this yesterday and thought some here would be interested. I skimmed through it this morning. It seems to be along the same lines as Ramiel Nagel’s Cure Tooth Decay book. I’m curious if you considered getting the lip tie snipped/lasered when you did find out or if Katie was too old for that? My son is 18 months and we just found out (thanks to YOU!) that he has a lip tie! I wish I’d known sooner so that he wouldn’t have the tooth decay on his two upper teeth! Did you also consider weaning early to help stop the decay (as it’s from the breastmilk sitting there)…. I know breastmilk is soo good for other reasons, I’m just wondering as we’re trying to decide if we should have the lip tie snipped or what to do at this point. Hi Sara, since she was already finished nursing by the time we discovered it we opted not to have it revised. Update: It’s been almost 2 months on the diet and I can’t believe the change already! The divets along the gumline have filled in so much! They are less noticeable! We did have his lip tie snipped as we were told the decay would have only gotten worse! So glad we’re on this diet and I thought I’d never be able to stop eating bananas but now that we’re seeing improvement (i have no tooth pain either! )… we’re feeling like we could eat this way forever! 🙂 Thank you! At the dentist today we discovered my 3 year old has a cavity. I was so heartbroken and upset the hygienist actually said “It’s not like she has cancer.” We are pretty crunchy and are very strict about brushing our teeth so I was absolutely shocked. Right now I’m torn between trying to heal it naturally or to get it filled. The dentist looked at me like I was an alien when I asked if there was anything I could do to try to heal it first before we did a filling. I set the appt. for a month from now. Do you think I would see any progress in just one month? Also, is fluoride in her toothpaste detrimental to her teeth? The thought of pulling fluoride out of the healing solution scares me! We’re on Day #4 of the diet in hopes that we can see remineralization of my 18 month old son’s teeth that have decay on them. There is a section on the website with pictures of a toddler each week and by 8 weeks, the teeth had remineralized!! I’m encouraged and giving it a go! I think you’d need more than a month to see results though. Who knows? This is what the website above says about fluoride: “Fluoride is highly toxic, and even swalling a small amount can enough to kill a child. Water fluoridation has been scientifically linked to brain and kidney poisoning as well as to cancer.” just so you know the other side of it. Good luck!!! My daughter has… 7 cavities. gasp. I am distraught. not to mention… dreading the next treatment plan. They said they can remove 2 of the baby molars (cheaper than crowning them..) but that the remaining 6 permanent molars all need to be filled. I was about to order some IQ Mega Omega 3 Fish Oil Capsules from DoTerra when I re-read this website that my friend sent me about curing cavities. We would like to make a plan to take care of it somehow before the treatment plan expires in 90 days… So, I wonder if this is enough time to make a difference. We do not drink raw milk.. She is lactose intolerant, and we have tried to monitor carbs and sweets, but we are far from perfect. She does enjoy cheese.. is that helping at all with any fatty nutrients? Can you explain to me what silica is and why it helps? How is it applied? Google is failing me. Thank you! I came across a blog post that made me think of you. It is about healing teeth, and it argues that Price’s activator X was actually omega 3 fatty acids, not vitamin k.
Can you tell me if the protocol works for cavities underneath fillings. And also if the nerve has been taken out. Can you tell me how long it took for your daughters teeth to heal. As a single mum, I’m wondering if its cheaper to get the dental work done if its a matter of years having to buy these expenive products and the $) plus shipping fee each time. Also thanks so much for posting your story. When you dont know if something really has a chance of working or not – its good to find someone who can tell you its the real deal. Fascinating! Thank you so much for sharing your story. Our dentist is recommending general anesthesia for our 2 1/2-year-old, but we have prayerfully decided to opt out for the time being. Instead, we bought fermented cod liver oil and have been giving it to her daily. We eat very healthfully, but haven’t completely cut out sugar (so hard!). Does your family eat any white or brown sugar? Please let me know how you make your toddler take the fermented cod liver oil with butter oil. I got the cinamon flavored one but I already have a hard time taking it myself! He takes Carlson’s lemon flavor cod liver oil but I’m afraid it doesn’t have the same benefits. You can put oil on the skin. I put it on the feet and put socks on and on the bottom. I mix the chocolate flavored fermented cod liver oil with a mashed banana, my 3 and 5 year old both love it! Hi, we use Nordic Naturals Childrens fish oil, its strawberry flavored. My toddlers just stand there with their mouths open and I pour one 1/2 tsp in each mouth. Quick and easy! I have them swish with water immediately. We have used many brands along the years, and if it gets on clothes, it smells horribly, and you will smell it all day! So I say… dont lick the spoon, just let me pour it in your mouth… So far, so good! I remember reading somewhere that you don’t recommend using xylitol, or you don’t use it. Can you tell me why or sent an attachment to a link about it? ok, excellent info! it may be the one thing you may be missing is copper. Critical to the absorption of calcium. Kelp is an excellent source. Keep up the good work, esp the fermented clo. Hello Heather, Thank you so much for sharing with us your experience with your daughter’s tooth decay. After my 4 year old’s 3rd (small) filling I started doing research and found “Cure Tooth Decay.” My son’s tooth decay is not rampant but he is definitely prone. I now give him fermented cod liver oil every day to see if that helps the problem. My question for you (a mother to a mother) is what do you do about x-rays in monitoring your daughter’s teeth? Research is “inconclusive” but does suggest that x-rays provided at a young age (every year or less) increases the risk of meningiomas. I do not have access to a holistic dentist (nearest is 2 hours away) and I can not find anything over the internet or in books to help me determine where to draw the line with x-rays. This is a bit off topic but I thought you might have info since you are probably having to closely monitor your daughter’s teeth in some form or another. Wonderful article. My question is simple – I am 35 and have, well, horrible cavities. I have gumline cavities on almost all of my teeth and a very deep one on the bottom front “sharp” one (bottom eye tooth?) that has gotten bad since the filling fell out if it a long while ago. Anyways I guess I’m wondering if such a bad cavity can be healed up, and will some simple changes bring on some healing fit the rest? I used to smoke until about a year ago, used to drink heavy till a couple months ago but I’ve had dental issues my entire life – I was born 8 weeks early. I’m thinking on adding homemade grass fed ghee, fermented cod liver oil, and making some remineralizing tooth powder based on benzonite clay … Think I’m on the right track if I start with those things? Also, obviously I am going to cut out sugar hehe. Any input would be awesome, its getting to where I’m going to have to get all my teeth yanked eventually if it keeps up. They are still strong right now though. Thanks!! In my opinion, it would be a good idea to buy the book cure dental decay, also read about silica and teeth, try healing the teeth for a short while (maybe about 2 months) and if there is no improvement, treat the teeth that can be filled with regular fillings. Remember that the longer one waits the worse the cavities might become. Help! I just discovered my son has decay and I am sure it’s from night nursing. 🙁 we follow a process food free, local farm raised food diet and eat sourdough bread from spelt and kamut we grind ourselves… Like you we were shocked to find decay in our sons teeth. I just got the cute tooth decay book but would love more ideas about changing my toddlers foods!!! Thanks so much. I wanted to know if the buffering increased the sensitivity on the teeth? My 3 year old is getting his buffer but I’m not sure if this will affect him negatively. The doctor say he just have some stains on the 4 front teeth and it can easily get remove. Do you recommend me to do something before or after the buffering? I forgot to mention he does have a little sensitivity on them now. Hi Archana, unfortunately according to Ramiel Nagel, many of the foods needed to support oral health are animal derived. My son is nearly two and was born with an undiagnosed lip and tongue tie. When his two front teeth were first coming in, we noticed two little dark spots, one on each tooth. Those dark spots have now become growing holes and causing a sliver of tooth missing at the base of each tooth. I’m still breastfeeding and now that the slivers are there its hurting when i feed him. I feel so bad. His poor teeth. can the holes and slivers themselves remineralize and grow back in? Fortunately his teeth appear to be strong other than that. The decay isn’t near the gum line. Any other suggestions? This has been our experience exactly with our son! Have you had any success? can I givethis to my 3 yr old for cavities? Hi, I am very intrigued by your post. My son had issues with his front tooth which eventually led to its removal just after his first birthday. His remaining front tooth is beginning to look “weak” as well, and his toenails on his big toe are rather weak as well. I’m planning to purchase cod liver oil for him to begin as a supplement, but I was wondering if you recommend the cod liver oil/butter oil mix. Thanks for posting! We used FCLO for this reason, but I should be better about giving it to our kids. They don’t love it, so I’ve done TwinLabs fish oil. Not as good as the real FCLO, I know. I caught that you mentioned Dr Petre… are you in DFW?? I had heard awesome things about her, but I wasn’t impressed when I went. Her staff was rude to me. I am glad you had a good experience though! Do you have any other pediatric or adult dentist recommendations? My understanding is Dr Petre doesn’t normally see kids anyway, right? Heather, do you believe that enamel regrowth (not just re-mineralization) can happen? And a tooth that has lost enamel, and had become more transparent, may fill-in with fermented cod liver oil and the diet you suggest? Fill-in to a point that enamel loss is reversed? Thank for your article. It was the best article on the web I’ve read about tooth regeneration. My daughter, 4 years old, went to see her dentist today and was told one of her molars at the very back has enamel hypoplasia and is crumbling, the dentist suggested capping it with a stainless steel cap. Do you have any suggestion on treating it naturally? Is enamel does regenerate and grow back, is capping really necessary? Hi Heather, I purchased the Heal Thy Mouth Summit. You wrote that the summit discusses “New dental protocols that can help remineralize teeth.” Can you tell me which presentation or Question and Answer session has that information? There is so much information in the summit, and I am trying to remineralize my son’s cavities before the decay eats into his dentin. I need to quickly find the relevant info in the summit. 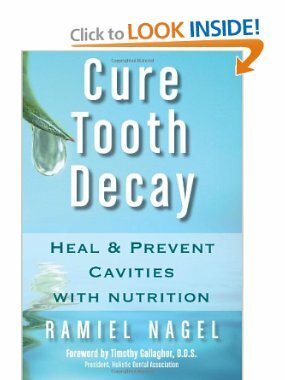 I have already read Ramiel Nagel’s book Cure Tooth Decay. Thank you! Hi I am having a problem with my 18 months old four front teeth being decayed. The whole front enamel is off completely. I took him into the dentist yesterday and he said that they could not be save able and need to be pulled out. The moment I heard this i began to cry. The doctor stated that he would have to be put to sleep in order to do this and this is a very alarming issue to me. The doctor also stated that there is a couple back teeth that need to be filled. The doctor hasnt done any xrays either. My question is how did know that yours daughter teeth were still saveable? I really do not want his teeth pulled yet I’m concerned for his adult or infection setting in. At this time I’m giving him silica phosphorus homeopathic tablets and all natural toothpaste. Also how did they fill your daughters other teeth cavaties? Did they have to put her asleep? I’m sorry I’m all over the place I’m just really scared and concerned for my son and at a loss at to what the right path is to follow. The problem is that I absolutely could not stomach fermented cod liver oil. I thought changing my diet (no sugar and processed food) would prevent cavities but apparently it’s not enough. Just how do you get your child to take fermented cod liver oil? It makes me want to throw up! I actually do throw up when I take FCLO!!! It makes me sick to my stomach, literally. I was choking it down for 2 years and usually gagging on it, but then started actually throwing up. I know that nothing was wrong with that particular bottle of FCLO because my daughter has no problem taking FCLO. My body just doesn’t seem to tolerate FCLO, yet I am the one with the cavities, which didn’t begin until all the vomiting during my pregnancy (hyperemesis gravidarum), continued through breastfeeding and still having cavities 10 years later. They also make a great butter oil. The FCLO burning my throat and my 2 year old’s, but this stuff is great! It’s raw and I know of other bloggers who recommend it! So much easier to stomach and has amazing benefits as the FCLO. I just came across your blog today. My daughter has cavities in her front teeth and I have purchased the book “Cure tooth decay”. Just wanted to ask you since you have seen the healing power, how much of the cod liver oil/butter did you give your daughter per day and also could you please tell me what you fed her that she loved? My daughter loves sweets and I need some good recipes that she will love and eat to try the healing. If you could give me a brief rundown of what she ate during the day, breakfast, lunch, dinner and meals. I would appreciate any help you can give. Also does she eat gluten free bread. Thanks so much for your help. We’ve just started, and I may just be enthusiastic, but our three year old’s teeth appear to be improving! We started looking for alternatives when the dentist wanted to drill out four of her teeth. They looked just like your daughter’s and we never had any luck with any store toothpastes. Hope this continues. We all use the same tooth powder now, something we found on Paleomama, and I never knew my teeth could feel so clean. Wow. Thank you so much for this inspiring story. Without it, we would have never thought to check under our son’s upper lip after we sadly noticed signs of tooth decay a few weeks ago. He’s 20 months old. We also would have never looked at our diet as the cause. We already ate real food but very plant based. We have since totally revamped it, added cod liver oil, and are planning to get the lip tie procedure done soon- since he is still nursing. I was wondering if I need to adopt the same diet since I’m still nursing him. I pretty much do, but I have a weakness for nuts! Also, the pediatric dentist we brought him too is a conventional one and she is suggesting flouride treatments every few months to remineralize. I bought Cure a Tooth Decay, so I know the author is very opposed to flouride. I also would rather not use it, but worry that I’d be taking away an opportunity to further help his teeth. Do you know if flouride treatments would inhibit the regrowth of enamel that would happen through nutrition (kind of like glycerin in toothpaste)? I thought we were very healthy before (eating a mostly vegan diet), but whoa I have learned so much in these past few weeks thanks to you!!! every one of us possesses! 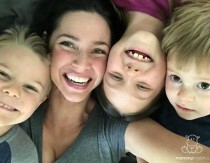 You stated that you were trying to figure out if Katie had a vitamin/mineral deficiency that caused tooth demineralization two years after this post. I was wondering if you and your practitioner have figured anything out? I am trying to remineralize my teeth and my boy’s teeth as well. He was lip-tied, and I found out thanks to your post (our chiropractor confirmed that he did indeed have a lip-tie). How did you get you toddler to take the fclo? I tasted it and puked, they deffinately will not stomach the horrible fishy taste. Any ideas?? We found a flavored version on Amazon. The Norwegian brand. And mix it in yogurt. My son is pretty sensitive to most tastes, and *knows* it’s there, but if you mix it just right they can’t taste it. Did you try giving it to them? My 18 mo old girl and my 17 mo old niece both just ate it with no issues. We just put it on a spoon and acted excited about it. It’s incredible how you were able to reverse your daughter’s tooth decay. I find it pretty impressive that completely changing her diet can drastically affect her teeth. I’ve heard about how the Vitamin D and Vitamin A in fermented cod liver oil helps to improve tooth health. How were you able to get your daughter to take a spoonful of it every day? I’ve been trying to get my kids to take cod liver oil to improve their teeth, but getting them to cooperate has been difficult. Guys the missing element is phytic acid! If you eat plant based diet with unprocessed grains as a staple this will erode teeth. Phytic acid is what plants use to ensure that the “packaging” stays fresh until plants are ready to sprout. This packaging also binds with micronutrients and can create deficiencies. At this point white, bleached processed carbs are safer than whole wheat grains (wwg). WWG must be processed differently in order to reduce the phytic acid and increase the nutritional content. Usually this involves some type of sprouting mechanism. I wish you mommies luck! Where can I find phytic acid supplements? I don’t see any on Amazon. Do you have any pediatric dentist recs who believe in remineralizing with food? Or perhaps an idea for finding them? Thanks! I am so excited to try your plan for reversing tooth decay! I was just wondering if you knew if the Homeopathic Silica would work as well as the ionic silica? Thanks!! My wee one can’t have dairy, so any suggestions there would really help. I have the Cure Tooth Decay book, bu it helps a lot to hear from other parents going through the same issues :). Thanks! My almost 5 year old has cavities in his molar. 4 to be exact. I took him to 2 dentist that won’t do it unless they sedate him. I am not ok with this. I am trying to find a dentist that will do it with only local anesthesia in his mouth, but in the meantime will this work for his molar cavities?? Where can I buy the ferminated cod liver oil? And is it just put directly to his teeth? Or put in food? Thank you so much in advance. This entire situation is very stressful. Hi, my 20 month old has fairly good eating habits, except that his older siblings sneak him candy. I’ve noticed cavities along the top of his teeth (he breastfeeds several times a day still and to go to sleep), and in a few of his molars. Would you recommend the fermented cod liver oil and butter together in a capsule? Or seperate? I’m so confused on how much to give. I want to order the book, but I need to start something now. This afternoon he fell and his tooth broke. I’m just so sad. I do all I can to be as holistic as possible, which is hard on only 1 income in California, but I try. We do need to eat a better diet and I am working on that. I just don’t know how much to give him or what other things we should be doing. He is allergic to milk, but I thought his allergy had gone away, so I started giving him whole cows milk again, but its upsetting his tummy so I have stopped. We are back to nursing because he doesn’t like (nor do I want to give him) soy, and he somewhat likes lactaid. Almond milk was another option, but a nutritionist told me not to give it to him. So how much of the silica would you suggest for a 2 year old, I am seeing decay on her front teeth. Thanks a ton for this wonderful article! I recently discovered that my 5 year old daughter has 5 cavities one of which needs a root canal as opposed to others that might do with a filling. I am so inspired by your blog and have begun the natural treatment to heal my DD’s cavities. We eat Rotis (flat bread made out of Indian Wheat flour) on a daily basis and it is part of our staple diet. I am wondering how can I cut on the grains in this situation. Thank you for your post, we have been following the basic Cure Tooth Decay recommendations (and yours) for about six months with some apparent success. My question for you is whether or not you continued breastfeeding after finding the decay and/or lip-tie? Or had you already weaned? We are just not ready to wean yet (she’s almost 2 now), but I am worried it could be a contributing factor to the decay. Would really appreciate any information you feel comfortable sharing. Thank you for your time! Hello , I can’t get the summit link to work and am interested in what they recommend to put on toddler teeth to slow decay. Thank you. I feel exactly the same as you described . My son also follows the same diet ( minus shellfish , family allergy) and I feel absolutely awful his teeth are bad. I am interested in what did you feed your baby(when she was 19 months old) especially in the morning? Right now my little daughter is almost 22 months old and I noticed all her upper teeth getting bad(it doesn’t look like cavity but something wrong with them…) and likes to eat oat meal for breakfast… if no grains, so what? right now I am offering to her egg with broccoli and homemade cottage cheese (it is kind of omelette, she hates cottage cheese by itself, so I mix it with egg), at the same time I am not sure is it ok to eat eggs every day for small kid. As a dental professional I strongly urge anyone with real concerns regarding their child’s oral health to seek a medically trained professional opinion. There is so much flawed within this testimony regarding dental fact. Decaying of teeth is an ACTIVE infection. Infections are sometimes deadly. The mouth is a very vascular area. Please be mama bears and exhaust all research when choosing medical treatments. I’m all about eating healthy, I’m a staunch vegan but forcing such a little girl to eat such a restrictive diet has got to be miserable. You might disagree but speaking from experience, I promise you later on she is going to have some severe food issues. Must be miserable for her too to not get to experience yummy food like all her friends. How very sad in the hundreds of comments, I could only find one person mention magnesium, one of the most important minerals for our bones and teeth. Just as important and ever more so than calcium! FCLO I’d wonderful and necessary as well but magnesium is so deficient in our soils – think about why giving your children high calcium diets is not protecting their teeth…..calcium fights with magnesium and depletes it. Join the “Magnesium Advocacy Group” on Facebook. The group owner is a brilliant man and his admin is so knowledgeable. This article will give you an idea of the importance of magnesium and how it has constantly been ignored for decades. There are many forms of magnesium and it is extremely hard for the body to absorb and replenish daily. The more bioavailable forms are magnesium malate, magnesium glycinate, magnesium chloride (transdermal liquid form). Magnesium needs to be taken with co-factors and the MAG group is a good place to learn. It’s not just for teeth and bones, it helps muscles and the brain plus so important for hundreds of things in our bodies. I was very, very unwell for a long time. It’s taken over a year and will take another 1 -2 yrs still but I am improving every day because of this most important but ignored mineral and the consequences on societies health due to chronic deficiencies and lack of it in our soils in at least the last 60-70 yrs since farming processes have changed. Such an excellent post on dental care. I am pretty sure several moms are going to love this that’s why I am sharing the article. Keep the good ones coming please. I know this post is from a little while ago, but I was wondering if you might be able to shed some light. My 20 month-old daughter definitely has tooth decay on her two front teeth. I noticed a while ago that they looked a little weak and behind them there are brown stains. She was also a year old before a midwife noticed that she had an undiagnosed lip tie. My almost 4 year old has small cavity in his middle front teeth. I really don’t know where to even began to remineralize it. His dentist thankfully wants to watch it and brush and floss.. But I wouldn’t mind trying something in addition to that. I do NOT want to do X-rays OR fillings on such a young child!!! My sons teeth have remineralized and hard but have brown stains. What did your dentist use to polish your daughters teeth? He’s 3 now and getting a cleaning next week in the “big boy”‘chair for the first time so I’m hoping we can aim for lightening up those spots and start feeling better about putting the decay behind us. Also, do you have any regrets about polishing? My dentist says the “scabs” may offer some protective value against decay in the future. Please help. I am so thankful I came across this article today! My husband and I are struggling with our children’s tooth decay, albeit not as bad as what you went through. Our 4 year old son has a couple of broken molars and one started to look really infected. I finally got him into our local pediatric dentist only to be informed that he needed the tooth extracted (which I was actually fine with) and then 4 other “baby” root canals along with stainless steel crowns. That set off about every biological alarm I have. My husband and I spent a few days researching and came across the work of Price and then I found your article today. I’ve just ordered the book “Cure Tooth Decay” and cannot wait to read through it. Needless to say we are getting that baby tooth pulled next week and then working on changes to our dental cleaning practices (tooth powders, herbal mouthwash, etc) and taking bigger steps in meal adjustments to improve the overall tooth health. We are already very health conscious in terms of eating whole organic foods, but never thought much about our teeth. These last few weeks have been utterly eye-opening for me. So, I just wanted to say thank you for sharing your story! Hi! My son may have his first cavity (baby tooth), and has his 6 month cleaning in a few days. I truly want to tell the dentist that I don’t want it filled, but am nervous that if it’s not filled the cavity will get worse. We’re going to try the protocol, but what I’m really wanting to know is…could you give me some menu/food/snacks suggestions for when your daughter was going through this protocol. I’d love to have ideas for school lunches and after-school snacks especially! Thanks. Are you able to share the name of the dentist that you took her to? My child’s teeth are going to require a procedure, and I am willing to travel to go to a dentist that preaches the Cure Tooth Decay protocol. Hi there, thank you so much for this article! I’m wondering if she was ever diagnosed with a defect called enamel hypoplasia? This definitely does not sound like normal childhood cavities. I’m wondering because that is what my nine-month-old son has. It’s a genetic condition, and it is not from poor diet or poor cleaning habits. I mean my son just got his teeth, and two of them have a little hole in them so it is not from decay. His dad had to have a whole bunch of dental work done under general anesthesia when he was only 18 months old! I of course am unwilling to except this without a fight, so I’m wondering if this protocol would work in this case. Fortunately he already is willingly taking his CLO and butter oil and is already drinking bone broth, it’s easy if you start them this young! Also we use a Norwegian virgin called liver oil instead of the fclo, it has a much cleaner taste and goes down easy, I think it is also recommended by WAPF. Anyone else have experience with this enamel defect? Do you recommend the Christopher’s Tooth & Gum Powder if I am unable to make the recipe you listed? I need to buy a remineralizing powder for my son and am not able to make something at this time. Thank you. Hi, I’d like to ask if it’s possible to use the Ionic silica for children at the age of 15 months? I wanna know hoy your baby is doing so far? Do you have any other suggestions about the protocol you used? Were you breastfeeding at that time? My babyboy has the same issue, and here in my country, Honduras, every professional blames breastmilk. Hi Heather, I am a huge fan of yours and so enjoy your blog!! My son is 5 years old and we’ve followed WAPF diet for years and yet he still struggles with horrid tooth decay! Its devastating! I did have a question for you. How are your daughter’s permanent teeth? I fear for my son’s permanent teeth and was hoping to hear how your daughter’s permanent teeth are holding up if they have made their way through yet. Thanks in advance!! Her permanent teeth are healthy and strong. In addition to the lip tie we learned over time that there were nutritional issues related to the MTHFR mutation that also needed to be addressed, so we did that as well. I hope you find the answers you need! This is great info! Thanks for sharing! By the way your daughter is so adorable! I have a son and he has super sensitive teeth. I just switched insurances through Insurance Line One for me and my family. Great post thanks! Hi there my son also has toothe decay. I may have misse in in your post or in the comments but is the tooth powder and suds safe to swallow? My son just turned three and still doesn’t really like to spit or rinse. Also he loves rice. I know I need to change his diet including mine. Do you have a menu or list of recipes you can share? My son is a picky eater and I feel like I get discouraged to try new things. How long did you make those changes before she was all better in that second picture? Yes I’d like to know this too please! I am going through this at the moment with my 23 month old and its … terrifying. I am worried her front teeth may even disintegrate. Its like there’s no enamel at all near the gums and they’re eroding. I have been trying tooth supplements: D3 with K2 drops, liposomal vitamin C high doses, and omega fatty acids from algae. After one month htye actually kind of look worse. I am really afraid. I will try the FCLO now, but the time it takes… her teeth may go. I am writing for advice but also to confirm the link you put in for the ionic silica is accurate, since you say it only has water… that link leads to a lotion which also has MSM. Fine but is it the one you meant? you said that you fed Katie lots of shellfish….can you give examples of things you prepared? not living in a coastal area, shellfish is not something that i really know how to cook, or incorporate. about using tooth powder – i’ve been using it for a while, but I often have bad breath. I tape my mouth closed at night which has improved the oxygenation levels of my whole body (verified with measurements at holistic dentist office), as well as improved my breath, but i still feel that since kissing toothpaste goodbye, i often have bad breath. i follow WAPF diet. do you ever feel that you also have bad breath? I would so very much love to hear from you. A hygienist is so important because you need to keep those gums healthy and it makes a huge difference because it slows down gum recession enormously. Hi! This poat has been really comforting to me – my daughter is 16 months and over the past 2 months her front four tweth have gone from having white spots to big brown spots! We have tried to implememt the cure tooth decay protocol amd have been to see 3 pediatric dentists….my question is did you have the lip tie corrected? My daughter has a lip and tongue tie and I think those are playing a role. Thanks!! How are your daughters teeth doing now? Did you end up finding any deficiencies? Working on my almost 2 year old son molars that came in and almost instantly started to have decay show up. She’d doing great now. We did discover some deficiencies that are likely due to genetic mutations (for example, the MTHFR mutation), so we adjusted our diet and supplements and things are going well. residual milk left in her mouth. My mom guilt is unthinkable right now. Simply reaching out for help. Thank you kindly..